A stand alone challenge to start today. I have big goals for today, we'll see later tonight if I accomplish them. Now onto the challenge. I was looking through my stash to come up with something different for this one. The challenge is Stars and Strips, as much as I love red, white, and blue I don't have many birthdays in July I can use that color scheme on. I found these cute Penny Black Stickeroos , going through your older stash is like going shopping, now I don't know if Penny has these stickers anymore because they are some of the first card making supplies I bought. I'm sure Penny has some new designs that she would be happy for you to browse at her site. With the theme and these stickers my card was launched(a small pun). I color copied some of the stickers because I wanted to pop them up and cut them apart in different ways, since I'm not selling my cards I think this will be o.k. 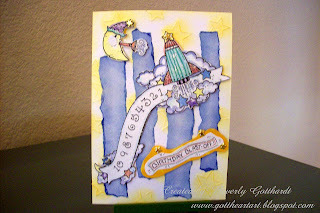 Supplies: Card Blank 5" X 7" White Value Pack Wal Mart, dry embossed stars, Penny Black Stickeroos, Inkadinadoo Artistic Blending Chalks, torn paper strips from my paper stash, small gold star brads, sentiment-my handwriting, pop dots. Terrific card! Love the whole launch rocket theme! Fun! 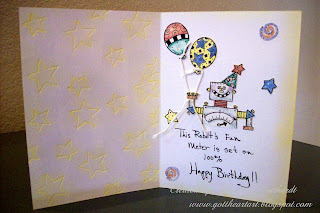 What a darling card, I love seeing the insides all done up too! Thanks for joining us this week at TPE. Adorable card! Love all the detail. Thanks for joining TPE this week!! This is such a great boy card! Fabulous detail. Thanks for creating with us at TPE!